The Soil and Terrrain database of Central Africa (SOTERCAF, version 1.0) was compiled at scale 1:2 million for the Democratic Republic of Congo and at scale 1:1 million for Rwanda and Burundi. The SOTERCAF compilation has been a joint collaboration of the Soil Science Laboratory of the University of Ghent, Belgium and ISRIC - World Soil Information, Wageningen under contract with the Food and Agriculture Organisation of the United Nations. Further assistance is provided by the Department BIOT of the Hogeschool Gent, the Royal Museum for Central Africa (Tervuren) and data holders in the Democratic Republic Congo, Burundi and Rwanda. The project started in September 2005 by deriving physiographic units from SRTM grid data based on SOTER landform definitions. 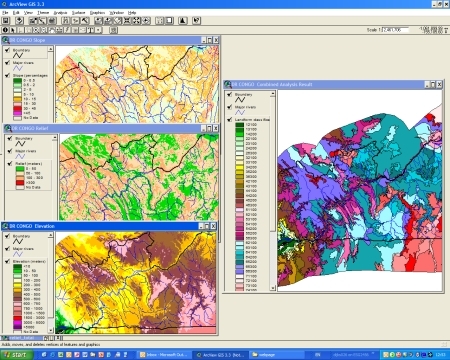 The database was completed in July 2006 after combining the physiographic layer with the lithology and soils layer. The border harmonization with the SOTERSAF database was finalized November 2006. SOTERCAF forms a part of the ongoing activities of ISRIC, FAO and UNEP to update the world's baseline information on natural resources.The project involved collaboration with national soil institutes from the countries in the region as well as individual experts. aa954c06-2b06-4eb7-8771-8f2216653b94 Access to the portal Read here the full details and access to the data.